Laax is both a ski resort and a ski region. There are three villages linked by lifts in the LAAX ski area (it should be in capitals) - Flims Laax and Falera. Flims is the largest and back before the 1990s was known as the main resort, but in more recent years the whole area has been marketed as LAAX. It is one of Switzerland's biggest ski areas, also known as the Alpenarena, and is crowned by the Vorab glacier providing snowsure skiing. The LAAX ski area is also one of the world's best known for freestyle boarding, being home to some excellent terrain parks and host of some of the world's biggest international snowboarding competitions each winter. 70 per cent of the slopes are situated over 2,000 metres above sea level and freestyle facilities include what's claimed to be the world's largest superpipe. When will it snow in Laax? The next notable snow forecast for Laax is 2cm1in, expected on 23 April, with around 2cm1in forecast over the next 7 days. The Swiss Ski Resort of Laax is part of the Flims-Laax-Falera ski area with access to 470km292 miles of downhill skiing, with 103 marked pistes, served by a total of 63 ski lifts. In addition to the skiing in Laax itself (235km146 miles of pisted ski runs), the appropriate ski Lift Pass will allow you to ski or snowboard in the other Flims-Laax-Falera ski resorts of Falera and Flims. Laax is directly linked by Ski Lift to the ski areas of Falera and Flims. With ski lifts as high as 2,477m8,127ft, snow cover is generally reliable. Flims, Laax and Falera had been jointly marketed as the Alpenarena over recent years, the name of the ski area that joins them, and more recently just under the name Laax, although Flims is historically the better known ski resort. Located on a wide and normally sunny mountain terrace, Flims is made up of two centres, the larger being Flims Waldhaus which dates back to 745 AD. The lifts, however, are at Flims Dorf, and Europe's first chair lift was built here in 1945 (entirely out of wood, with steel being in short supply after World War II), linking the resort to Foppa. The resort's history as a tourist resort dates back a further 70 years before that first chair lift, when the local pastor had the idea to build an hotel, the Kurhaus Waldhaus, with 120 beds. Walks to a newly built restaurant at Lake Cauma were also constructed and the initiative was so successful that illustrious guests began to arrive, the hotel was enlarged and a casino added by the time the Dutch Queen Wilhelmine arrived in 1893. The tourist office opened in 1904 and winter sports were embraced straight after the war ended. The Naraus - Cassons cable car was completed in 1956. In 1978 this was extended up to the Vorab glacier, where a chair lift and two T Bar lifts are operational. In 1996 the Mountain Transportation Companies of Flims and Laax combined to form the White Arena Corporation. The longest possible descent in Laax is 14km9 miles long and the most difficult run is the 'Fatschas 65'. The Laax ski area,incorporating the lift linked skiing above Flims and Falera, covers some spectacular terrain accessed by a well integrated network of cabin lifts and modern chairlifts. The longest trail is an incredible 17km (11 miles) long down from the Vorab glacier to Flims. Beginners can start off their skiing careers on the wide gentle nursery slopes by Flims Dorf or take the chairlift up to 1,590 metres at Startgels. 36% of the terrain suits intermediates, as does the 44% of trails graded easy, giving most cruisers four-fifths of this huge area to enjoy. Recent investment in lifts includes the new eight seater gondola 'Arena Express' from Flims to Nagens for the 97-98 season, and a new six seater chair from Plaun to Crap Sogn Gion, so it's easy to get back up the mountain quickly too. Highlights for good skiers, who have 22% of the terrain graded black, include the downhill from Vorab to Alp Ruschein (6km (4 miles) of pure joy) and the World Cup Descent from Crap down Laax offers its own special challenges. Other favourites for good skiers and experts are the black down from Cassons Grat to Naraus and, at the end of the day, the long descent through the trees down from Nagens, which can ultimately continue on to Flims Walhaus. So you can ski back to the resort centre, even if you need transport to get to the lifts from there in the morning. The New Technology Centres (NTCs) at the base stations in Flims, Falera and Laax, as well as in Nagens and Crap Sogn Gion, are a good idea. They offer new equipment in all its forms, including skiwear and lift tickets, so you can kit yourself out in the latest gear slopeside and off-you-go. Cross country skiers are well catered for as well in the Laax area with 60km (36 miles) of prepared tracks, with some floodlit for night skiing. Laax is a major boarding centre with board-friendly uplift facilities - mostly modern chairs, gondolas and cable cars. Snowboarding events are organised throughout the season. The snowboard school, with1080 instructors, offers private or group lessons (maximum of 8 people) in free style, racing and all-round courses as well as weekend and week-long camps. Party spots at the base of the stations, such as the Crap Bar , Riders Palace and the Casa Veglia at Laax or the Iglu, and the Legna in Flims. The Tourist Board organises a seemingly endless variety of packages incorporating these events and/or schools, rentals, accommodations, concert tickets. Flims, Laax and Falera are particularly good places for children to learn to board as the new Kids Village incorporates many snowboarding features such as a mini half-pipe and mini boarder-cross and a big snowboard Tipi base. Usual opening is early November (Open weekends in November then fully open from mid December), and usual closing is Late April. NOTE:- Lift and Piste openings are always subject to Snow Conditions in Laax. Laax is able to make snow, on 15km9 miles of ski runs, with 80 snow cannons. The 30 ski lifts of Laax are able to uplift 42,000 skiers and snowboarders every hour. Laax is in the Swiss Alps in Flims-Laax-Falera, Grisons, Switzerland. The nearest airports to Laax are St. Gallen-Altenrhein, Friedrichshafen and Lugano. There are 10 airports within three hours drive. In Laax the WaWa-Bar, 200m from the Murschetg base station, is popular for its romantic, cozy atmosphere. The lobby Bar in the Riders palace is also popular. The crap Bar in Laax has a stunning 24 ton granite bar to support the weight of the wide range of brews available. Although Waldhaus has the majority of the facilities in Flims, those looking for lively nightlife are more likely to find the action in the slopeside bars such as the Iglu at the base station in Flims. The nearby Albana Pub and Stenna Bar are also busy as soon as the lifts close and can continue right through the night. The 420 year-old cellar - converted in to a club beneath the Hotel Bellevue is an interesting and atmospheric alternative. Younger skiiers will find plenty to occupy their musical tastes in the Red Cat in Laax and the Cheers Bar in Flims, whilst the Casa Veglia in Laax-Murschetg offers a wide range of live gigs including rock n roll, dixie and rythm n blues. Want to Know when it Snows in Laax? 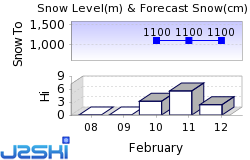 Click above to get Snow Reports by e-Mail for Laax. By doing so, you agree to Our Rules. Other popular Ski Areas near Laax. Ski Hire Shops in Laax. Want to ask about skiing and snowboarding in Laax? Or contact Laax Tourist Office. Note :- The information on J2Ski concerning Laax, where not clearly factual, is opinion only and is neither definitive or exhaustive. Warning :- Snow Sports are Dangerous! Skiing, snowboarding and all winter sports involve risk of serious injury or death. You MUST confirm all information, especially snow and weather conditions, in Laax before you ski or board. You participate at your own risk.